​FLT is 70 years old! We thought it was only right to celebrate this anniversary with a slice of cake and a bit of a buffet at our recent AGM. 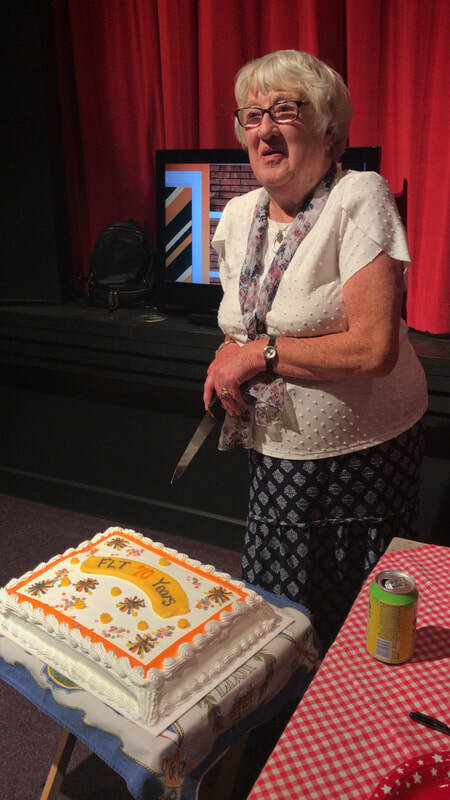 Our President Pat Stirzaker did the honours of cutting the cake. If you want to find out more about our history you can pick up a copy of the book on the subject written by founding member Norman Pickles next time you are at the theatre. Here's to a new season, and many more adventurous years! Albert Nobbs Farnworth Little Theatre. As Albert Nobbs settles into retirement, little did he know he would start this era of his life without his dearly beloved. Following a road accident, Albert’s wife Connie is tragically killed. The play begins with Albert talking to his dead wife as he lies in bed and that’s where the laughs begin - and they never stop. Act one is full of reminiscence and we are taken from present day to past times in the flash of a light resulting in some pretty hilarious scenes. Act two sees Connie return as a ghost to keep her eye on Albert – much to his astonishment. From the opening curtain to the final bow, the cast had the audience in the palm of their hands. One minute we were laughing out loud, the next we were in silence as the pathos in this cleverly written script was delivered with expertise. ​Robin Thompson as Albert played a blinder. Funny beyond words, especially in his thong, he squeezed every nuance of comedy and pathos out of Gordon Steel’s brilliant script with spot on comic timing throughout. Seasoned actor, Thompson was believable from start to finish and never once dropped his character. Jane Murphy equalled Thompson’s performance as she breezed her way through the piece as Connie. With great facial expression that depicted her every mood, she oozed confidence as she shifted from devoted wife to battle-axe with ease. We saw Murphy’s true acting ability as she portrayed her ghost with some poignant moments that came across really well. Completing the trio in this three-hander, Pat Hill played her dual role with aplomb. As Alice she was vulgar, funny and almost common, whilst conversely, as Rose she was endearing, empathetic and strong which complimented the Alberts’ many displays of grief. A good all round performance which was balanced and well measured. 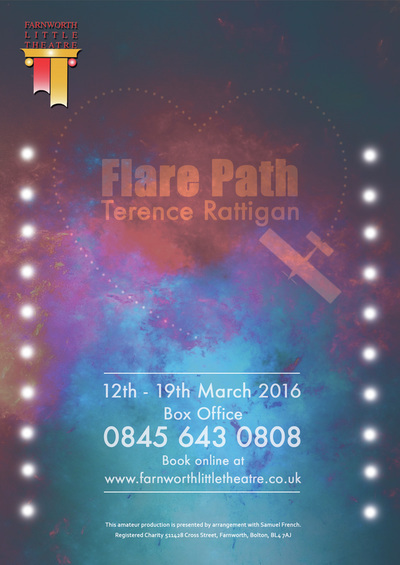 Lighting by Phil Brookes added to the success of the play as it provided the right ambience. Director Dave Eyre has once again produced a great piece of theatre which left the capacity audience wanting more. Set in suite 719 of the New York City’s Plaza Hotel, we are treated to 3 scenes, all set in the one room with different cast in each. In order to celebrate their wedding anniversary, Karen Nash has booked the room for herself and husband Sam with a view to rekindle those honeymoon memories. However, little does she know that not only has she got the date wrong, her husband is more interested in spending time with his secretary. Yet again, Joy Plowes is a pleasure to watch as she breezes effortlessly through the piece, bringing every nuance out of Neil Simons’ very clever script. Joy’s ability to pay pathos and satire is remarkable, culminating in the final words of this scene brining a tear to many an eye. A great performance. Richard Leigh, as husband Sam presented a strong performance of the stuffy businessman who distracted himself away from the truth, until he could lie no more. The transition from being in control to his confession was easy to see and put the top hat on his performance. The second story tells us about movie producer Jesse who meets up with his old flame, Muriel after 17 years apart. James Abercrombie plays the suave Jesse to perfection with the right amount of self-assured arrogance. Julie Hall as the timid, yet passionate Muriel is brilliant. Hilarious to a fault, this was a quick fire performance that deserved the laughter it received. Together, both actors created a realism that transported the audience into their world for the duration of the scene. Completing the trio of scenes, we have a bride to be who has locks herself in the bathroom refusing to come out. Carol Butler as the bride’s mother turns in a cracking performance as the stressed out mother of the bride whilst John Howarth as the bride’s father is equally as manic as he goes all out to get her to open the door. Both try cohersion , persuasion and an authorative approach to no avail which results in a broken arm, broken ankle and ruined hired suit. Again, a well suited duo who both play their roles with a consummate ease. Supporting roles by Matt Seber, Connor Haslam, Louise Davenport, Amber Sargent and Rob Hurst were well performed and were the perfect complement to the respective plots. The finale was presented in song (That’s Life) which in my opinion didn’t work. The usual bows would have sufficed and would have been the perfect ending to this successful and enjoyable production. 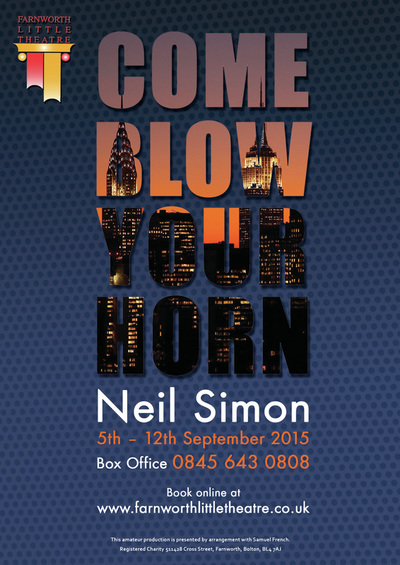 Director Paul Ward has ensured Neil Simons’ script was well presented and has produced a great all round production. Get to see it if you can – you won’t be disappointed. Pat was appointed at our recent AGM on the 20th August 2017, and was said to be delighted and over the moon with her new position. ​ We are very pleased to announce that our Youth Group will be restarting on 28th April (7pm to 9pm) thanks to Gemma Norris, Amber Sargent, Rob Hurst and Adam Manning. Having risen through the ranks themselves they are looking forward to bringing on new young talent to add to our future casts. If you have any children, grandchildren or know of any youngsters aged 11 to 18 who might be interested then please do not hesitate to contact Gemma Norris on 07729 436 304. ​The future of our theatre lies with these youngsters. Congratulations go to Sara Hassall and her technical team for winning the GMDF Technical Award for our production of "The Turn of the Screw" directed by Natalie Crompton. Our congratulations go to all the people that tirelessly work behind the scenes to create the sets, the lighting, the sound, the props and of course to the actors that bring to life the performances. The awards ceremony will be held at The Last Drop Hotel & Spa, on 8th July 2017, and anyone wishing to attend should contact Adam Manning. The dates of reading and auditions for the next play are listed below. More info on the plays and parts available here. ​We would love it if you could help us celebrate the launch of our new season by coming down on Sunday 28th February at 7.30pm for a free drink, nibbles and to hear from our directors about what we have got coming up next season! 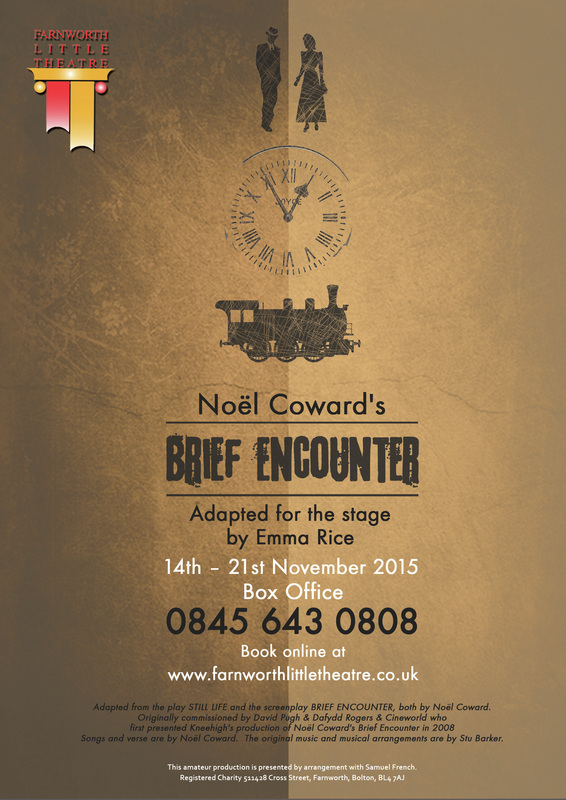 FARNWORTH Little Theatre took a trip back in time to get in character for its production of Brief Encounter. 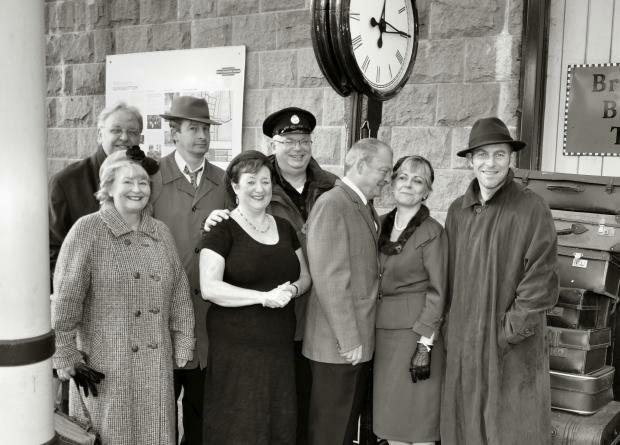 Director Andrew Close and members of the cast went over to Ramsbottom railway station to get some promotional photos for their version of the Noel Coward classic, which was based on one of his one-act plays, Still Life, written a decade earlier. Emma Rice, artistic director of Kneehigh Theatre Company, has adapted the timeless tale of joy and heartache for the stage, interspersing the romantic action with nine Coward songs. FLT's production will mark 70 years since David Lean's iconic film version of the play was released in 1945, which features Celia Johnson and Trevor Howard as principle characters Laura Jesson and Dr Alec Harvey. At FLT, Janet Leather and John O'Connell take on the roles which focus on a chance meeting at a railway station. Andrew said: "It's a fantastic story – a real classic. "We went to the old train station in Ramsbottom to get some cast photos and get us into character because the play is set around a refreshment room in a railway station." Congratulations to FLT members Louise Davenport and Paul Ward on their GMDF Best Actress and Best Director awards for The Accrington Pals. 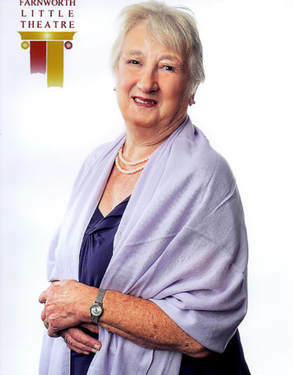 Congratulation to Edwina Freeman and her cast of An Inspector Calls which won a Best Production award for FLT. Season tickets for 2015/2016 are now on sale. 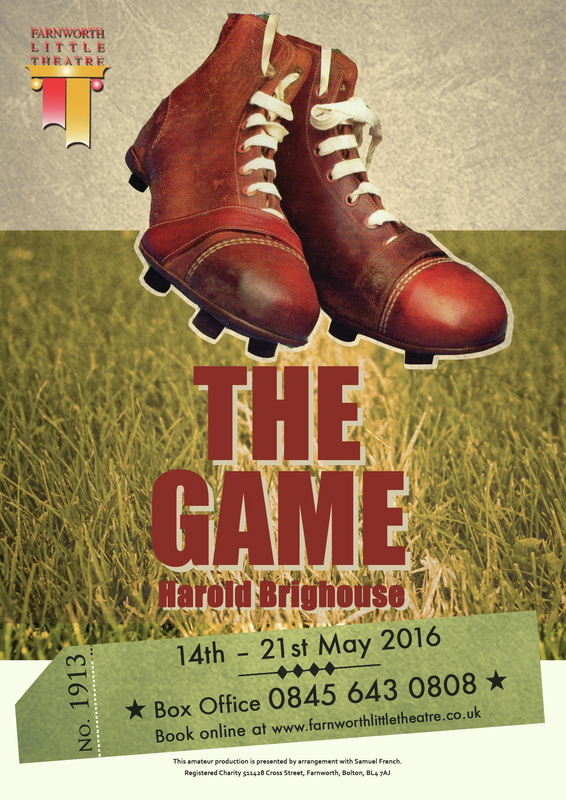 For more information about the plays click on each poster, or to find out how to book click here. Gemma and Cath have now left FLT Youth... read more here. Congratulations to the cast of The Steamie who won The Adjudicators Award for excellent ensemble cast and consistently maintained authentic accents. You can see all the winners on the GMDF website. We wanted to update you on the changes that will be taking place in the coming weeks. Gemma Norris will be standing down as Youth Theatre Leader as she starts her training to become a drama teacher full time. We are very pleased to announce that we have found a replacement leader and we are confident the group will continue to thrive. We will have more information on the new leader after official appointment at the AGM. In other news, Jeannie will be standing down as Box Office manager and Gemma will be covering this role until a replacement is found. We are extremely grateful for Jeannie's hard work and dedication over the last few years. Gemma can now be contacted on the usual Box Office number with any queries. This means we now have volunteering opportunities in the Box Office. We would like to give people the chance to staff the Box Office for one night during the run of the plays. This will be great experience for anyone who might like to learn how to use an online ticketing system, or is interested in working in an arts venue, but also would be a huge help to the theatre. We want to have a team of volunteers staffing up the box office, just as we have selling tea and coffee or working on the bar. Full training will be provided and the only skill you need is to be computer literate. If you would be interested in volunteering and gaining experience in this area, or just want to find out more about what is involved, please email gemma.norris32@gmail.com or call 07729436304. Congratulations to Mike Jones and the cast of The Dock Brief who won runner up for the best play at the GMDF One Act Play Festival! A big congratulations also goes to Bob Hopkins who came away with the best actor for his part in our production! Well done to everyone involved and to all the winners. As the mysterious Inspector Goole interrogates each member of this affluent family he uncovers their connections to this tragic young woman’s death. Stripping away layer upon layer of deceit he exposes the lies that infect this seemingly respectable family to reveal the deeply entrenched hypocrisy at the heart of Edwardian society. An Inspector Calls is J.B. Priestley’s most famous work. It has been produced on stage, radio, television and in film numerous times since it was first performed in the UK in 1946. 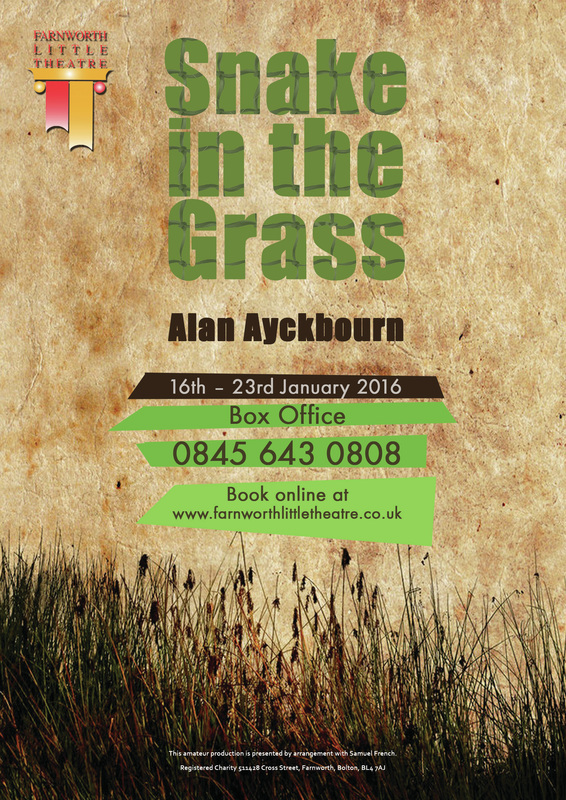 A powerful and poignant drama based on a real-life story. When they arrive in France, the brutal reality of the trenches is beyond anything they were prepared for. And back home amongst the women they leave behind – their mothers, wives, daughters, lovers – nothing can ever be the same again. Domestic quibbling is given a rigorous once-over in this gently satirical comedy. For Henry Smith – actor, raconteur, sporting hero, leading socialite, business tycoon, secret agent, Casanova and acting President of the United States – life was rarely dull. For Alice Smith, housewife, life was rarely anything else. Enter Michel, French waiter – tall, dark, and available. Exactly what happened next, no-one’s quite sure. Except that it involved a rotting melon, a deckchair and a bottle of neck-rub. Fantasy blurs into reality. Secret passions explode. And two worlds which seem a million miles apart are suddenly on a collision course. It could only happen to Henry and Alice. And only their pet goldfish, Orca, and you, will ever know the true story. It’s 1953 and all the girls in Nottingham want to work at John Player’s, the best employer in town. Player’s Angels have a good wage, a tobacco allowance and a reputation. Whilst Cyn dreams of being a beauty queen and Vee adjusts to married life, widowed Glad shares a secret with her young supervisor Bill. When the youthful Mae comes to work at Player’s, however, the lives and secrets of all the women change forever. Based on real stories of the tobacco industry, Player’s Angels was staged in Bristol as The Wills’s Girls and became a BBC Radio Four Woman’s Hour serial. Researching for his new novel, Charles Condomine invites the implausible medium Madame Arcati to his house for a séance. Whilst consumed in a trance, Madame Arcati unwittingly summons the ghost of Charles’ dead wife Elvira. Appearing only to Charles, Elvira soon makes a play to reclaim her husband, much to the chagrin of Charles’ new wife Ruth. One husband, two feuding wives and a whisper of mischief in the air - who will win in Coward’s unworldly comedy? Interested in auditioning for any of the play? Find out the dates and times.